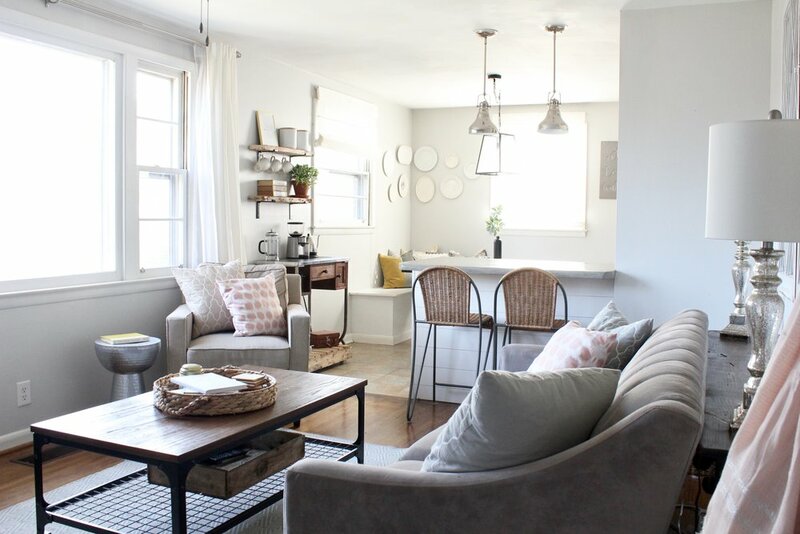 I'm about to let you in on a little secret that everyone knows but nobody wants to admit: the key to making your home look pretty in pictures is having a few photography tricks up your sleeve. I've seen from experience that even the most beautiful of homes can look lackluster with a bad photo, and a seemingly simple house can be beautiful when shot in the right way. I want to share a few of my favorite tips and tricks for shooting beautiful home photos that I have learned over the last four or five years of shooting interiors. Disclaimer: I am NOT a professional photographer. By any means. My sister is a professional photographer, and I know so many others who have spent years and thousands of hours perfecting their craft. They have better equipment than I do, and they have more experience than I do. And they deserve to be paid well for their expertise. It's on my to-do list this year, in fact, to bring in a professional interiors photographer to take photos of our renovation after we check off a few more things. But while I may not be a pro photographer, I am a professional interior designer, and having good photos of the spaces I'm working in can be a make-or-break marketing tool, so I have learned a few tips, tricks and shortcuts along the way to taking and editing beautiful images. A lot of the learning process is simply trial and error. It takes a lot of time and a lot of photos to learn what works for you. I hope that by sharing a bit of my personal process, however, you can take a way a few tools for your tool belt. I cover the equipment we use, a few tips and tricks for interior photography, how I edit my photos, and my favorite photo apps! If I'm ever asked to whip out my camera and take photos of moving humans, I feel like a fish out of water. I've taught myself to take pictures of inanimate objects in styled spaces, and that is my wheelhouse. That said, I have learned a few photography basics that you can implement TODAY to up your photo game. #1: Turn off all the lights! Nine times out of ten, your photos will turn out better if you turn off all the artificial light, open the window coverings, and let natural light do its job. Occasionally, this isn't possible in a room without windows or something, but most of the time, the warmth of the lightbulbs casts shadows and affects white balance in a way that simply isn't pleasing. Take a look at your favorite interior Instagram accounts (StudioMcGee is one of my favorite examples), and you will notice that in all of those gorgeous images, none of the light fixtures are turned on. Instead of relying on lights, learn your way around your camera and fidget with shutter speed, F-stop, and ISO. Then add some brightness in editing later to make those pictures pop (see more on editing below). I generally like to shoot my photos from around four feet off the ground. I hardly ever get my best picture from standing height. Start paying attention to your favorite home photos in Instagram and in magazines, and take a look at where the photographer was standing. Does it look like they're looking down at the room from above or looking straight on? The cleanest lines and shots often are made or broken on camera angles. This is possibly one of the most well-known rules of photography. If you're not familiar with it, this article has a lot of useful information. The basic concept is this: pay attention to where the focal point of your photo lies. Have you ever looked a picture and felt like you don't know where your eyes are supposed to focus? It can take away from the composition of the photo when there isn't a solid focal point. The rule of thirds says that it is most pleasing to the eye when your focal point sits along one of the lines created by breaking the photo up into 9 parts. Almost every photo editing app will show you that grid when you use the crop function, and it is often a good idea to crop the photo so your focal point sits around the 1/3 mark on one side or another. Can you see in this photo? My face is one third from the top and one third from the right. This is more aesthetically pleasing than if I was right in the center or some other random spot. I don't ALWAYS follow the rule of thirds, but the general idea is that it's important to pay attention to the composition of your photos. Another way to say this is that LESS IS MORE. When you're taking a photo of a room, start by taking good inventory of all the stuff in the photo. And you should probably take about a third of it out. For kitchens, take everything off the counter unless it's strategically placed there for the photo. For living rooms, pare down the accessories. For bedside tables, all you need is two or three items. Even if you live with more stuff on a day-to-day basis, stash some of it away for the photos. One of the best things you can bring into your home for a photo shoot is fresh flowers or greens. They breathe life into a space and create organic shapes that are interesting to look at. My favorites are hydrangeas, eucalyptus, olive branches, and tulips. I don't want to get too technical because I don't understand it all myself, but one of my favorite tricks (especially with my 50mm lens. See below) is to pull the F-stop down really low (around 4.0) and blur out the background or foreground to focus on something. See this photo below how the horse becomes the focus because the flowers and chandelier in the foreground are blurry. You can also use portrait mode on your iPhone for this! You will have SO much more control over editing when you shoot in RAW format. See more about this below in editing. You can only use RAW images if you're using a software like Lightroom to edit, but if you are, having the RAW file allows you to do so much more in post. Of course you can take photos with your iPhone, and a lot of people do (more on that later). But I find that my best photos are always with a DSLR camera. We have had our camera for about 6 years, so it is not top of the line by any means. We will likely update cameras this year to something without a crop sensor, but our Canon Rebel t2i has served us very well! I am really familiar with Canon products, so I will probably always be a Canon user, but you can swap out the specifics of this kit for whatever brand DSLR you are used to using. The Canon Rebel series is user friendly for photography newbies, but it also has all the features that I need to get the photos I want. The biggest step forward I have taken in equipment is investing in two lenses in addition to the basic lens that comes with the camera body. I now have a wide angle and 50mm lens in my arsenal, and these have been the biggest game changers for me! If you are unfamiliar with lingo, the basic idea is that a wide angle will allow you to shoot entire rooms in one shot and get the big picture, and a 50mm lens is great for detail shots and sharp focus shots. 1. Canon EF 50mm Lens. This little lens is so great. You can't beat the price. It's versatile and creates beautiful up close, detail shots. 2. Canon Rebel DSLR camera. As I mentioned, you can get something much nicer and newer than what we have, but it has served us well and is a great starter DSLR! 3. This nifty camera bag is compact and simple, but we love it for travel! 4. The Sigma 10-20mm Wide Angle Lens is responsible for about 80% of my room shots! I love that I can capture the big picture of a room even when it's a small space. 5. This little SD card reader is a MUST HAVE for everyone in my opinion. I do a lot of editing on my iPad, but it's equally awesome for iPhone users. 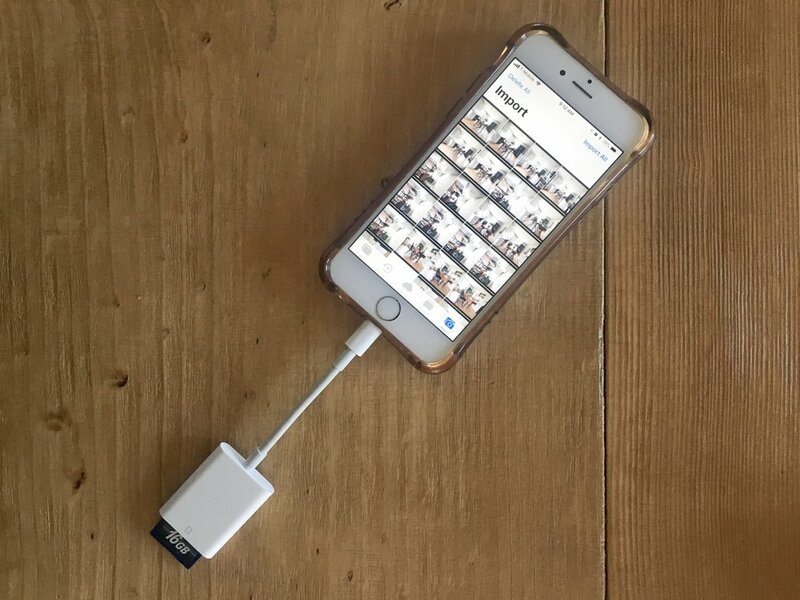 You can take the SD card straight from your camera, plug it into your phone, and boom bam pow, you have all of your photos directly on your phone. One thing to note: I bought a knock-off version on Amazon and it broke within a couple of days. I recommend springing for the Apple version on this thing. 6. A sturdy tripod. This tripod is less than $20, and it does the trick well! A tripod is absolutely essential for getting crisp, well-lit images! One of the reasons paying for a photographer is expensive is because their value not only lies in their ability to snap a good shot but also in their editing skill. Even the best photographers have to edit their photos. Editing is an art, and it's so important to learn to edit your photos well. I could write paragraphs on editing and still there would be SO many things I wouldn't be able to cover (and even more that I don't even know about! ), but I will give you a basic overview. The primary things I mess with when editing are brightness, the curves tool, highlights and shadows, white balance, and sharpness. I personally hardly ever use filters. I really like the colors to appear as natural as possible. But I find that white balance is extremely important. Just take a look at a few examples of what a HUGE difference editing makes. Here is a bathroom that was really hard to shoot because there was almost no natural light. I did my best, but I knew that I was going to have to work some magic later. This is an example, like I mentioned above, of leaving the lights off even though it seemed like just flipping the lights on would be the easiest fix. And after a little Adobe Lightroom magic. I used the Curves Tool, adjusted exposure, contrast, highlights, and shadows, used the "Auto White balance" setting, and upped the sharpness a little bit. I also straightened the photo in the crop tool by making sure the ceiling trim was straight. I started with this photo. It's okay, but I didn't like how cool the light was coming in, the shadows are dark, and it just feels like it doesn't "pop." First I uploaded it to my iPad via my handy SD card reader (see equipment section above), and I pulled it up in Lightroom. I start by using the "auto" settings in both the "Light" and "Color" sections. Then I usually adjust from there. After I had it edited to my liking, I decided I wanted to remove my cell phone from the kitchen counter. This is where the Retouch app comes in. This app is AMAZING for a quick way to delete things from your photos that accidentally made their way in. A little highlight and a press of a button and VOILA! No more iPhone on the counter! Check out the magic I worked in this photo to get rid of the cables and white electrical outlets underneath the TV. 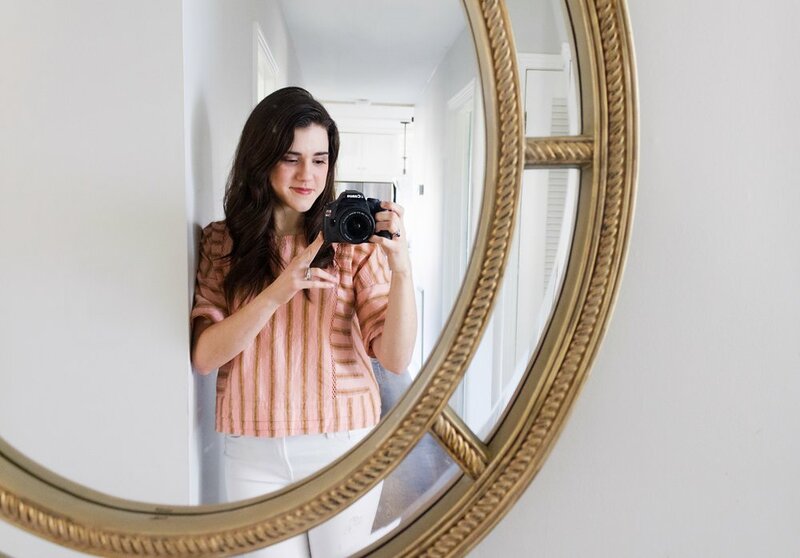 Whether you're trying to grow your Instagram or you just want to share pretty photos with friends and family, you are capable of taking beautiful photos of your home! I hope these tips and tricks that I've learned have been helpful. But the most important thing is just to snap as many photos as you can. You'll learn by doing! Are there any other tips you have that I missed here? Apps you love? I would love to hear it! Drop ceilings are incredibly common thing in our part of the country. I had them in my basement growing up, and our Red Brick Ranch had them in the downstairs bathroom. 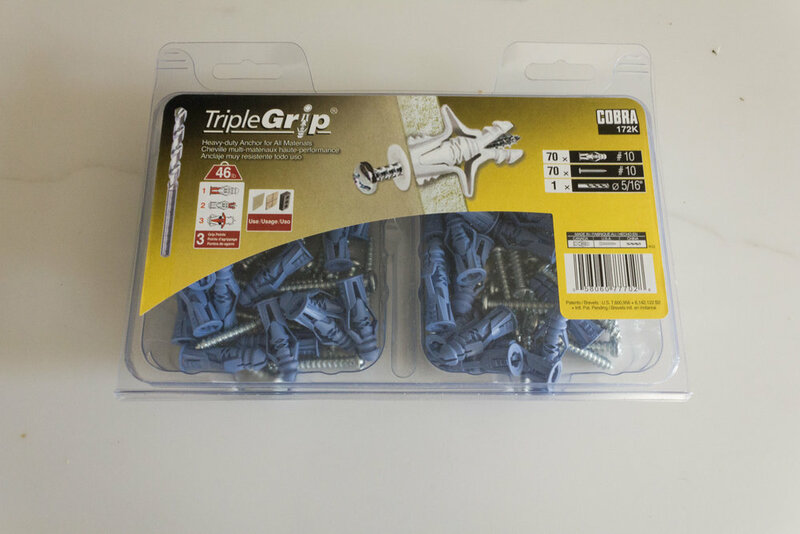 They are a very convenient/inexpensive solution in areas where there are pipes, vents, etc. hanging below the rafter line. BUT – inevitably, after time, they get pretty nasty. It doesn’t take much water to leave a nice big water stain, and they seem to attract dirt as well. When we went up to Long Island to work on Tim and Sydney’s house, one of the main projects we wanted to accomplish was to replace their old, stained drop ceiling. It’s a rental property, so entirely replacing the ceiling was out of the question, but we wanted to do something to replace those nasty tiles. Chandler and I came up with a simple solution that we really love! Home Depot sells 4’x8’ bead board sheets. They are easy to rip down into tiles so that they fit in standard drop ceiling frames. We tested it on the Red Brick Ranch bathroom first and it worked great! So we took our idea North. Here is a quick video showing the impact of this project and step-by-step instructions. 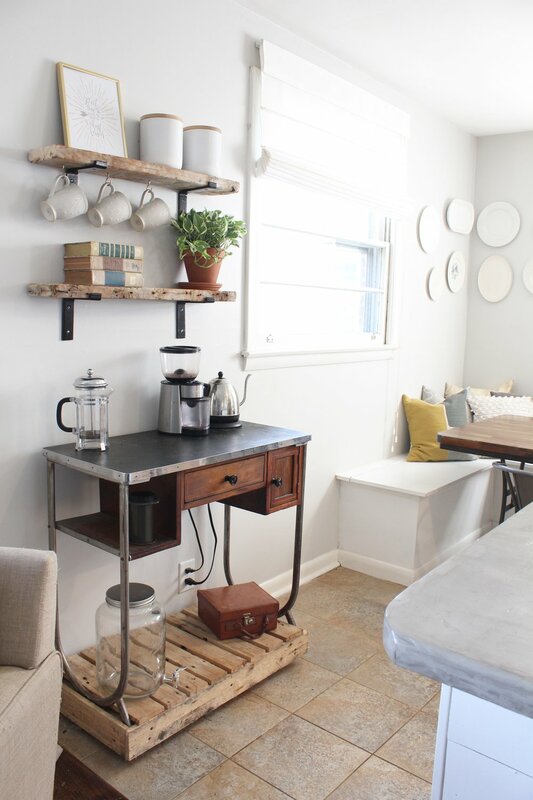 It’s both budget and time friendly, especially compared to drywall! Have you come up with any other creative ways to replace your dropped ceiling? Let us know! 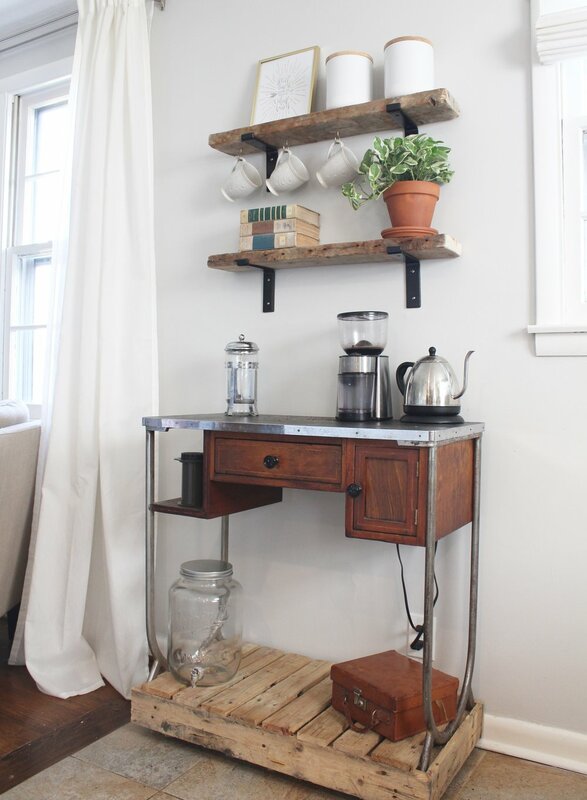 We love creative DIY solutions! Disclaimer: this post was written last week before we left on a trip. Now we are back and the floors officially look AMAZING. So read on with confidence that we finally got it right. Hi all, Jeremy here…writing to you on a fresh subject from our new place. As I type, Chandler is upstairs putting the second of three coats of sealer on our newly refinished hardwood floors. If all goes according to plan, the final coat will go on tomorrow morning and we’ll leave for vacation to let the floors set in all their newly refinished glory. Obviously from my first few sentences (and if you follow us on Instagram stories) you know that we decided to DIY the hardwood floors. I’d just like to shoutout to anyone who refinishes hardwoods for a living: YOU GUYS ARE WORTH EVERY PENNY THAT YOU CHARGE! Man, this is not an easy task if you’ve never done it before. We read a lot of blogs that said it was simple, and while the processes are pretty simple, we ran into a lot of roadblocks along the way that threw us for some loops. I’m not going to write a step by step guide here. There are a lot of articles on how to DIY your hardwoods, and I don’t want to add to the confusion. What I would like to do is to share a couple major mistakes we made, as well as some tips we found really helpful, with a bit of comic relief sprinkled throughout. 1. Sanding/Edging. Only reading one or two articles on sanding hardwood floors is a big oh no no. Sanding is a pretty simple concept, but there are techniques that are really important. I’ve included a link to one of the better articles I found (although I found it a little late) here. 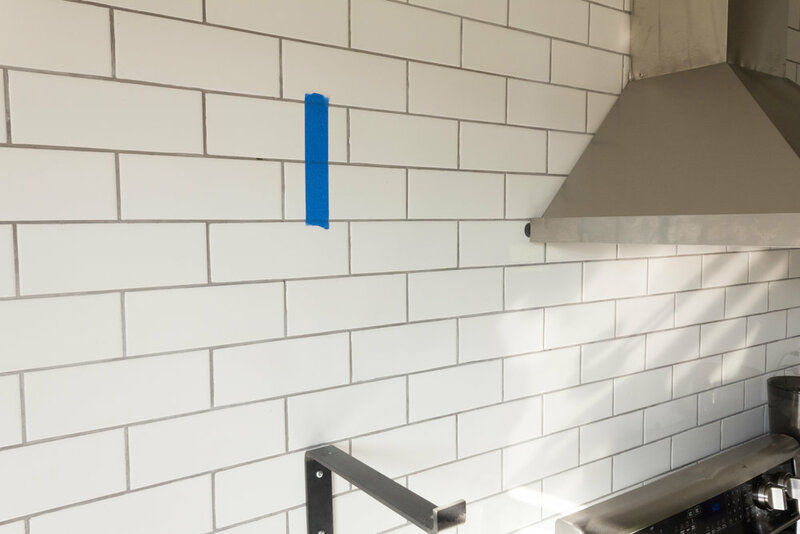 The part that got us was the edger…it’s not a super easy tool to use, so when you rent make sure you get all the tips you can from your local professional before diving in. 2. Not doing all the floors at once is a big oh no no. Sparing you all the details, we got it in our minds that finishing half the floors in our first round of renovations was the best course of action. It was not! Wait until you can do them all at once. Just wait. Please. Save yourselves. 3. Using consumer polyurethane is an oh no no (in some cases). Minwax Polyurethane that you get from Lowe’s or Home Depot is a general-purpose poly. It’s used for anything and everything from furniture to floors. It is not specifically designed for floors, and because of this it is not as easy to use and may not yield the finish you want. We had a pretty serious freakout when we finished what we thought was our last coat of poly. After it dried, it was really uneven and parts were INCREDIBLY shiny. Like, it looked as if we were gazing onto a sea of glass (with hardwood underneath of course). What we found was that while we had been using mineral spirits to keep the lamb’s wool applicator fresh, when it mixed with the polyurethane it diluted the sealer. This is actually a good thing! The portions of the floor that were more diluted looked the best, but again it was very uneven. So the caveat here is, if you decide to go with Minwax, dilute it. See below for further details. 4. Rolling Sealer. There’s a lot of conflicting information online regarding how to apply sealer to hardwood floors. I am here to clear all that up for you, but there are a few layers so hold on tight. - If you are using a consumer polyurethane (Minwax) from Lowe’s or Home Depot, rolling it on is a BIG oh no no. The lady at Lowe’s even said it would be ok, but it was not. After our first coat, we had a ton of air bubbles in our sealer and it royally freaked us out! Luckily these bubbles came out when we screened the floors with the buffer, but the cause of the bubbles was definitely using the roller. We switched to a lamb’s wool applicator for the second coat and it was MUCH better and actually easier as well. - If you are using a true flooring sealer/poly (We used Poloplaz brand. We LOVED it), rolling is OK! We used a poly we got from our hardwood supplier for our topcoat and rolling it on worked great! Just make sure you’re using a roller with at least a 3/8th inch nap. - Lamb’s wool applicator always works. If you’re worried about rolling, just get a couple of these and you’ll be just fine. So if you’re still reading this, wow. I thought once we spilled the beans that we don’t actually know what we are doing that you all would turn your backs on us and leave us to our own demise. Well thanks for sticking with us. Next stop on the blog train, positivity station. So back to Tom Haverford. While Tom takes his “oh no no” list very seriously, there are qualities in certain women that may cause him to overlook something on this list. He doesn’t have a name for these qualities, but for blogging’s sake let’s call them the “oh yes yes” list. So here is my “oh yes yes” list for refinishing hardwood floors. 1. You save a lot of money. This is the reason we went with DIY on this project (and also because we didn’t think it would be this difficult), and oh yes yes did it save us some money. I haven’t tallied it all, but off the top of my head I think we must be under $500 total (tool rental, stain, sealer, accessories, etc). This does not include the new hardwoods that we bought, but just the price of refinishing everything. By my estimation, that saved us about $2,500 over hiring a pro. Not bad if you ask me! 2. Talk to your local flooring professional (not just someone in the paint department at Lowe’s) before beginning this process. Oh yes yes, these guys are super nice and will give you tons of helpful and practical information! Don’t be afraid, they are happy to help. We went to the local hardwood flooring wholesaler, and they gave some helpful tips. 3. This is a two-part oh yes yes. Should you go with flooring specific sealer/polyurethane? Oh yes yes. It makes a big difference. You can make Minwax work (see next point), but if you want ease and comfort and best finish, get the pro stuff. 4. If you decide to go with Minwax (which you shouldn’t. Really, just please don’t), dilute it with mineral spirits. Oh yes yes, this can save you a lot of heartache. We did one coat with a 2-1 poly to mineral spirits ratio and one coat of a 3-1 poly to mineral spirit ratio. The 2-1 was a little thin, but 3-1 worked really nicely! We are still going with a true flooring sealer for the topcoat, but the Minwax worked fine for our first couple coats. 5. Can you lay new hardwoods yourself? Oh yes yes. This was honestly the simplest and most gratifying part of the process for me (even though it’s technically not part of “refinishing” the floors). We had about 350 sqft of hardwoods we needed to lay. While it was physically draining, it was an easy job technically speaking. It definitely helps to have a partner lay out the boards for you as you go! I have one more important life lesson from Tom Haverford that pertains to refinishing hardwood floors, and that is the concept of “Treat Yo Self.” You need to take breaks and relax. Tonight, Chandler and I went to Burger Shack as a “Treat Yo Self.” We just couldn’t muster the energy to cook, so to clear our minds we went and got the best fast food burgers/fries around. Sometimes you just need French fries covered in cheese, grilled onions, and Thousand Island dressing. So whatever it takes to Treat Yo Self, do it. So as we leave for vacation, our hardwoods are sitting and sealing. To be honest, this has been the most grueling DIY project we’ve ever taken on. I’m not sure if it’s because there are just a lot of layers to this house renovation and I’m taking out my frustrations on this single project or what, but there has been a lot of anxiety regarding these floors. At the same time there’s a lot of hope that when we return, the floors will be everything we wanted from the beginning. It’s been a long process and a ton of work. There have been tears, blood, sweat, cursing, and praying. But we are headed out, firmly believing that when we return we will have beautifully refinished floors. Follow-up to come! But for now, au revoir! Hey everyone - Jeremy here. Some of you may have seen the little bar cart that I build Chandler for her birthday a few years back. It’s the one that sits between our living room and our kitchen. I built it out of a small desk we found at our favorite antique shop in Chattanooga (R.I.P. Knitting Mill Antiques) and made the cart portion out of some old pallet wood we had. It actually rolls pretty smoothly on hidden little rubber casters. She thought it was pretty sweet, and I got some major husband brownie points. Throughout its existence, the bar cart has been a bit of a mystery to us. We’ve used it in a number of ways – we considered making it a mobile kitchen island, we’ve put our knives and cutting board on it, and more recently we’ve put some of our coffee stuff on top and our record player on bottom. This worked pretty well, but there just isn’t enough space for all our coffee gear there, so it’s scattered about the kitchen. Like many of you, Chandler and I both LOVE coffee. We probably register slightly on the “coffee snob scale,” although we aren’t quite to the “whisper sweetly to your coffee grounds as they roast” level. Chandler is an every morning coffee drinker, and I’m more of a post-lunch-mid-afternoon kind of guy. We have slowly been investing in more and more coffee gear (as well as reorganizing our house), so we decided it’s high time we created a central spot for our coffee. So as you can see, we cleaned off the cart, put up a couple shelves with some cool industrial brackets from Home Depot, and voila. We have this awesome coffee area now! Not only is it really functional, each piece of the coffee station has a story. - The bar cart is the one I built for Chandler for her birthday. I know it's special to her, and I think it's pretty cool too. - The shelves are from a piece of driftwood I found while at a lighthouse on the coast of Maine last Spring. For 9 months I've had no clue what to do with it, but I don't think I could have found shelves with more of a story. The art print is from one of Chandler's favorite artists in Nashville, Kristin at Winsome Easel. She combines calligraphy with watercolor in a really cool way. Definitely check out more of her prints! We tried to add a little life by putting a plant on the shelf, but we keep forgetting to water it. Fingers crossed we don't kill it too quickly. I love this spot. A place that we once tried to make unassuming has now become a focal point in our main living area. Come by and I’ll make you a cup on the house.